(edited by Maria M. Ebrahimji and Zahra T. Suratwala, White Cloud Press, May 2011). Hi everyone! 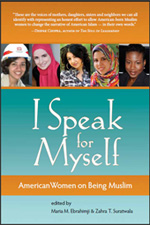 I’m Zahra Suratwala, co-editor (along with Maria Ebrahimji) of I Speak for Myself: American Women on Being Muslim (White Cloud Press, May 2011) and President/CEO of Zahra Ink, a writing firm in Chicago. I am pleased to welcome you to this column, which Feminist.com has graciously given a home. It is always exciting for me to collaborate with brilliant women and to experience the power of speaking up and speaking out. A community of strong women such as those found here on Feminist.com has limitless potential and I am inspired by it. Five years ago, my co-editor and I began envisioning I Speak for Myself because we felt that Muslim American women were being spoken for in the media and in the ongoing conversation about Islam and Muslims. Stereotypes about Muslim American women being oppressed or coerced or subservient were easy to find, and they seemed to be espoused by people who were not Muslim themselves! We were tired of hearing from others what we were about. We were tired of being clumped together under a group of labels that disregarded the incredible diversity that exists among Muslim American women. So we decided to come up with a platform for women to come forward and tell their stories. When inviting people to write essays for our book, we did not give them a topic or a theme. Rather, we told them to simply write about what was important to them. The women in the book are individuals: they hail from different backgrounds, different professions, they claim different nationalities and different values. The book clearly celebrates the diversity in our community, but since the stories are, at core, about people making their way through this world, it is wonderfully unifying as well. Writing, for me, has always been a way to process what I am feeling, to assess where I stand at any point in my life. This book takes that idea a step further: perhaps in writing my story, I can make something clearer for someone else. Perhaps I can help create community. There is no emotion that I have felt that you, reader, have not also felt. And so if I tell you my story, honestly, bravely, I know that you will connect with me. In speaking for ourselves, we invite all others to do the same. By speaking for ourselves, not only will we highlight the differences that make us unique, but we will see ourselves in each other.